It can sometimes be challenging for a couple to design the perfect vacation. One wants to relax and rejuvenate while the other wants action and adventure. One wants recreational activities, the other wants to immerse in culture and history. Finding balance on a barge in France was the answer for me and my husband. Barging is a perfect adventure for a couple. Once the reservation is made, there are no more decisions to discuss. There is nothing to argue about, except perhaps who is having more fun. You can eat what you want, drink what you want, and your partner can do the same. The bar is stocked with the world’s best selections. It can be tea time for one and cocktail hour for the other. There is no navigating and debating about which way to turn. The Captain and crew get you where you need to be, when you need to be there. “Everything is possible,” chanted Captain Arnault whenever a passenger made a request. Driving, map reading, and calculating currency conversions can add stress to an international vacation. 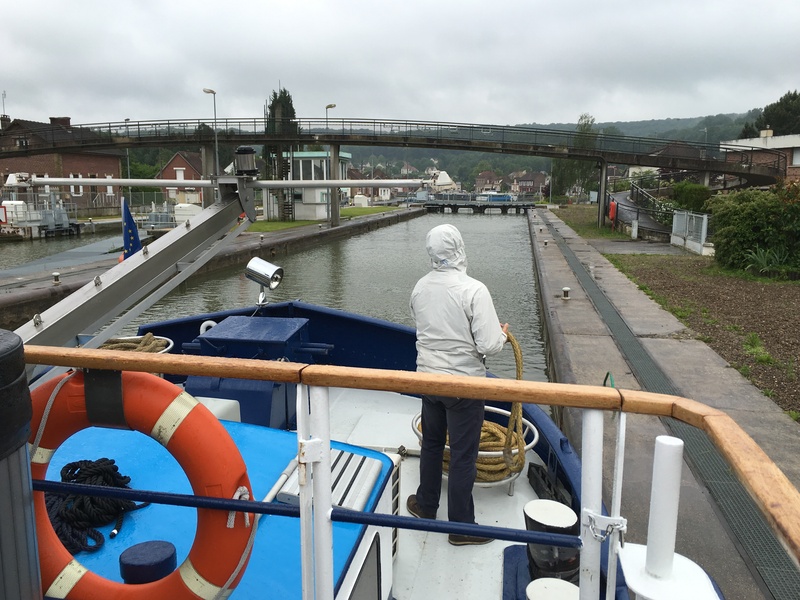 On a European Waterways barge tour, the crew takes care of everything. This is truly all-inclusive, even the excursions. 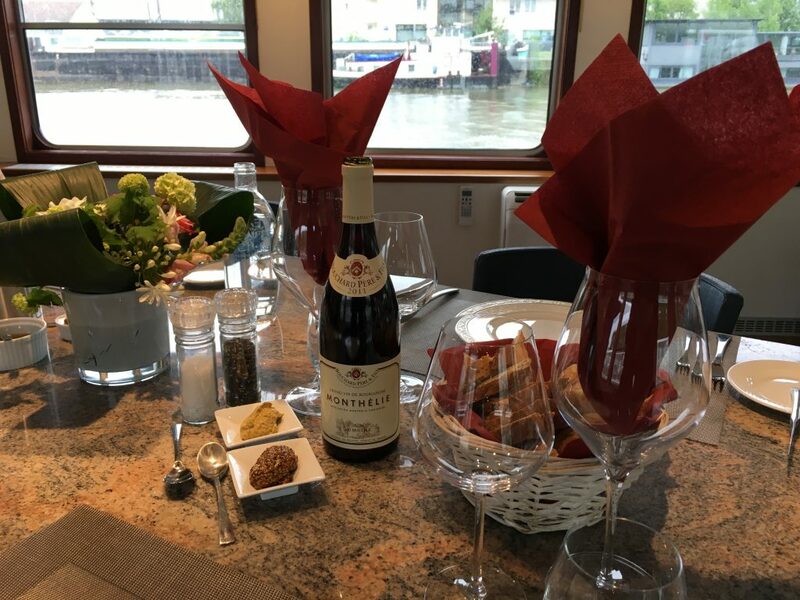 We found the perfect balance aboard Panache, one of the 18 premier barges in the fleet of European Waterways. 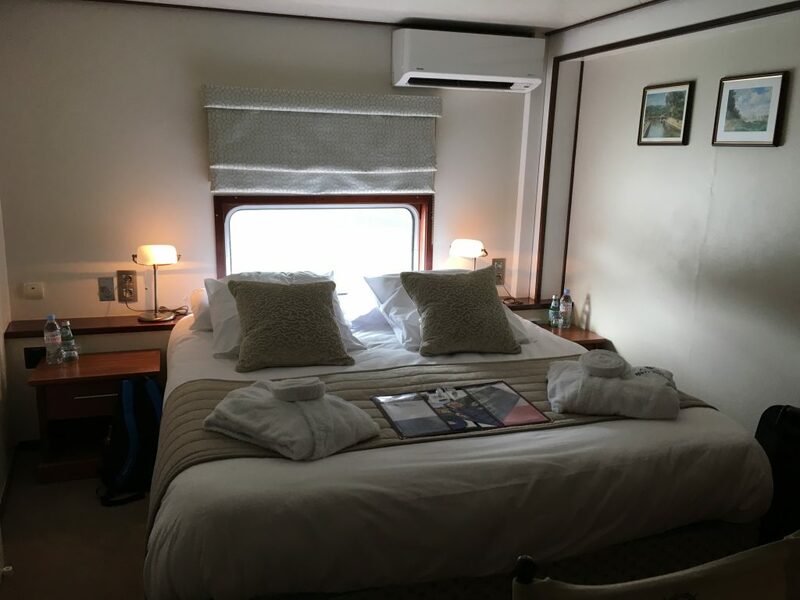 Originally built and designed as a freight hauler, Panache is now a luxury 6 cabin, 12 passenger touring vessel. Beginning in March, Panache starts in Holland with its six person crew. Holland in the spring is the perfect time to view the tulips. From June to October, Panache meanders at 50-70 miles per week to the south of France, ending in the Alsace and Lorraine regions. It exchanges guests each week. The itinerary changes, depending on location. 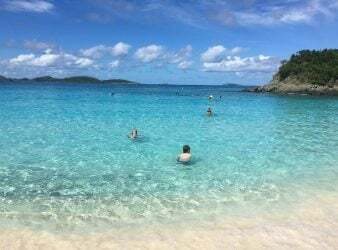 Whether you choose your week based on your schedule and availability, or are enticed by a specific itinerary, there are new things to be learned and new experiences to enjoy on every leg of the journey. This is life in the slow lane at its finest. 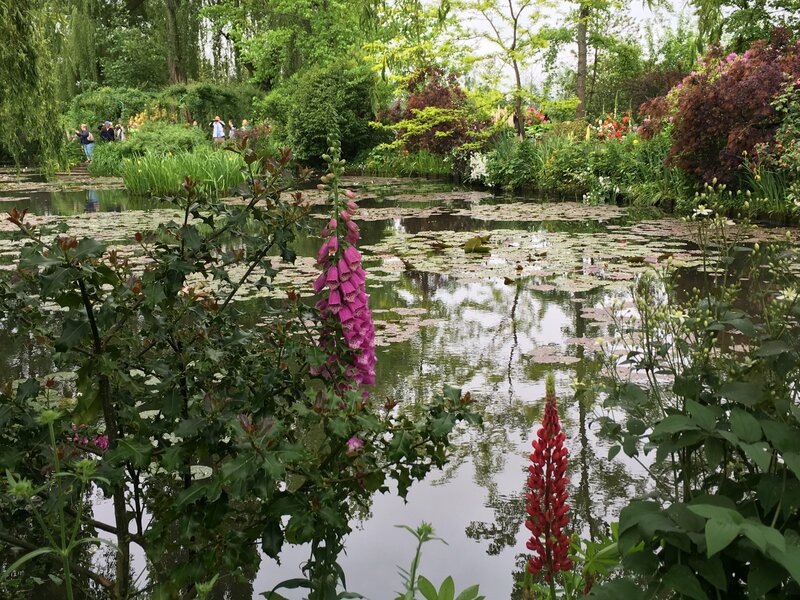 Choosing to walk in footsteps of the impressionists, we met our host in Paris for a short drive to Panache in Noyon. 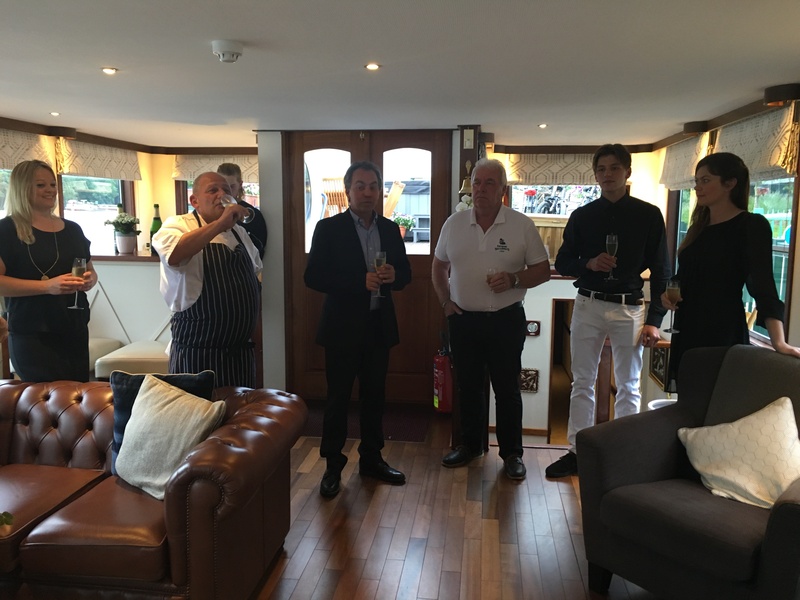 As we arrived the crew greeted us with champagne and canapés. The purple petunias in flower boxes along the railing of the ship were in full bloom, a remnant of the barge’s previous weeks in Holland. The passengers and crew all became fast friends as our Captain introduced us to the barge and we settled into our cabins. A 30 minute bike ride down the tow path before dinner was just what we needed to acclimate to our home for the next week. 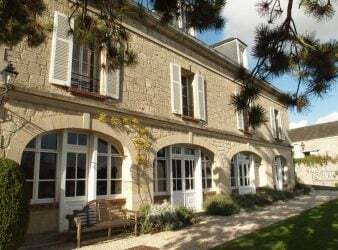 The schedule typically allowed for a half day of relaxing and enjoying the spectacular views along the Canal du Nord and Oise River that once provided subject matter for the impressionists, and half day excursions to local venues. 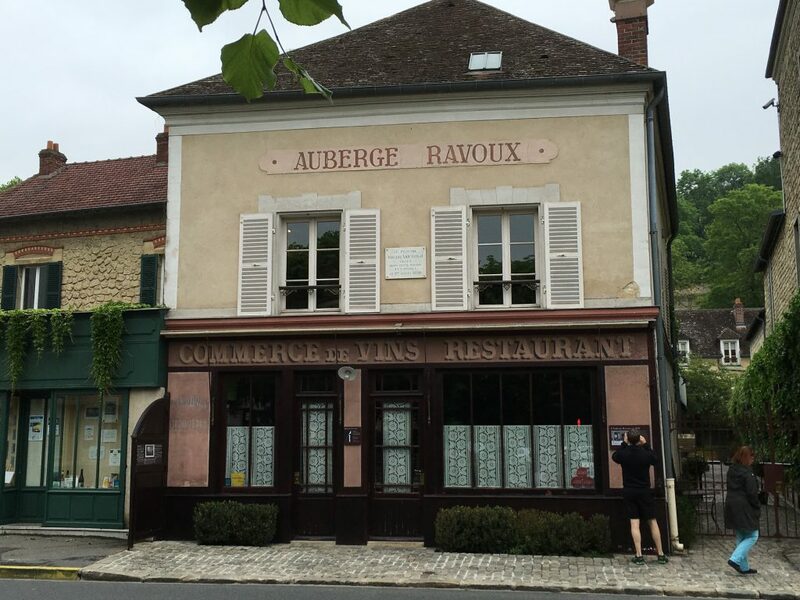 Our planned excursion included Compiegne, Chantilly, Giverny, and Auvers sur Oise. 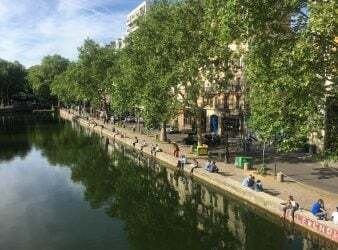 All of these stops are easily accessible within an hour or two of Paris by train, bus or car, but seeing them via a barge means less transport time and travel hassle each day. The barge travels only during the day, so sleeping at night is still and peaceful. Hiking through the forest of Compiegne, the venue of the signing of the Armistice in 1918, visiting Monet’s Garden in Giverny, enjoying the palace and horses in Chantilly and visiting the final residence and gravesite of Vincent Van Gogh in Auvers sur Oise enriched our knowledge of French history, while also giving us a taste of modern life in France. With our Captain and tour guide by our side we were never lost in translation. A fine wine presentation is made every day at lunch and dinner. 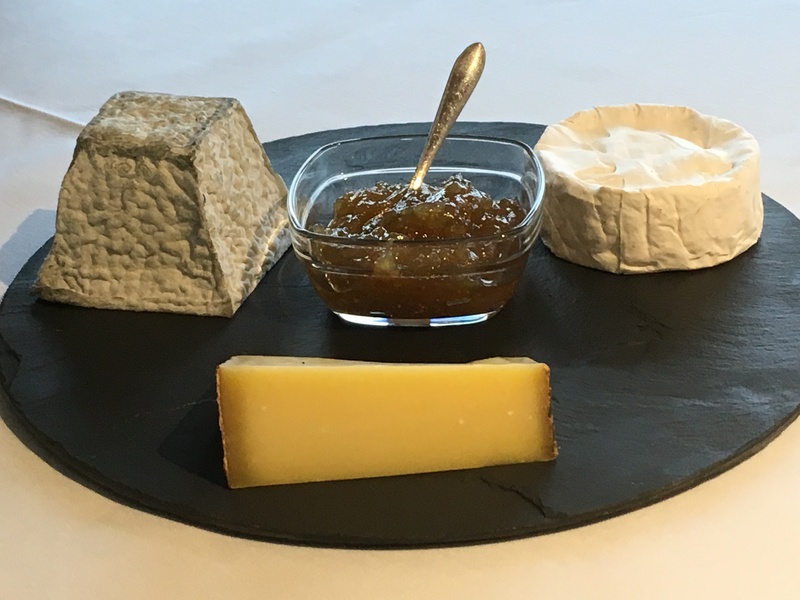 A cheese presentation is made each night at the end of dinner. There is a set menu, prepared daily by the chef from fresh ingredients bought at local markets. When the ingredients are fresh and local, everything tastes good. When the menu descriptions are in French, the cuisine tastes even better. Trying new foods is part of traveling, and there is no better place to eat than in France. The food was more than just sustenance. It was art, with a bit of history thrown in. Chef Bryan came out of the kitchen at each meal to introduce the meal, and returned at dessert to see how we enjoyed our meal, often with history about the origins of the menu items. 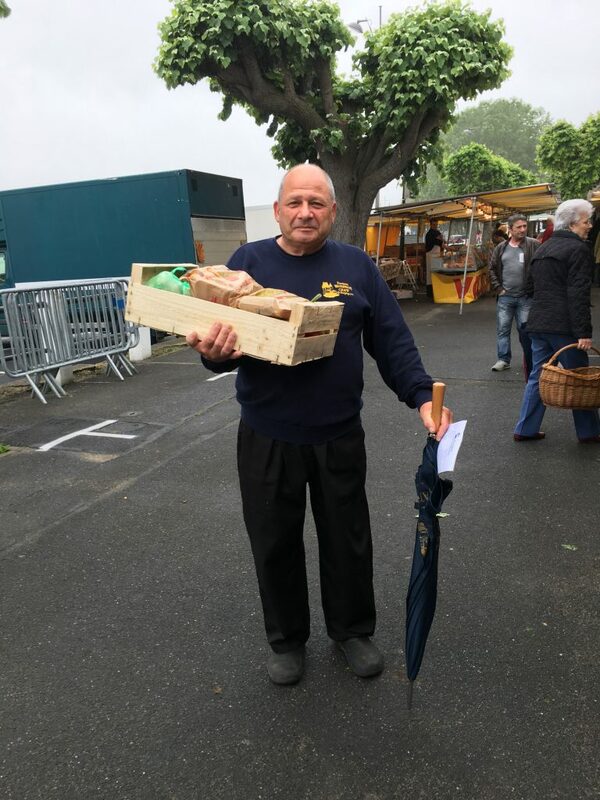 As a Brit living in France, Bryan blended both cultures into our food. 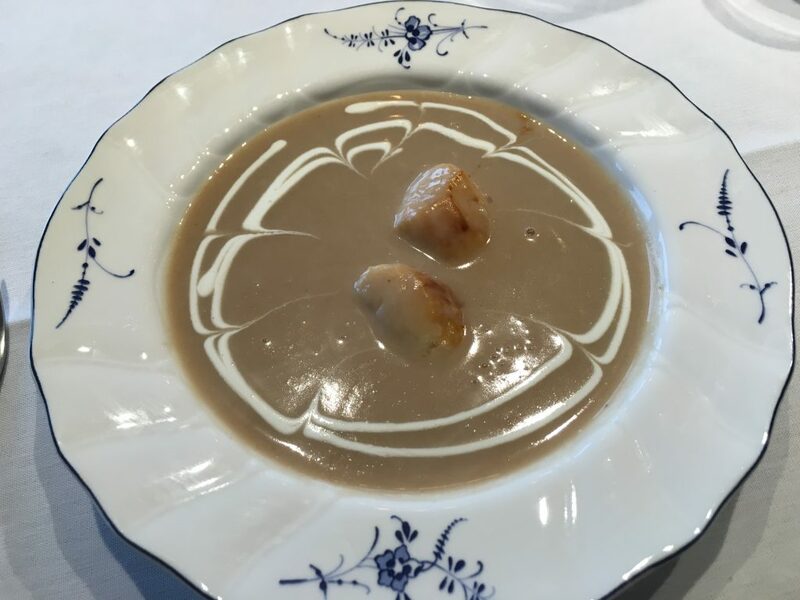 His cream of chestnut soup with seared scallops, roasted duck breast with orange braised endive and green beans with burnt orange followed by crème brulee was just one example of what we looked forward to each evening. 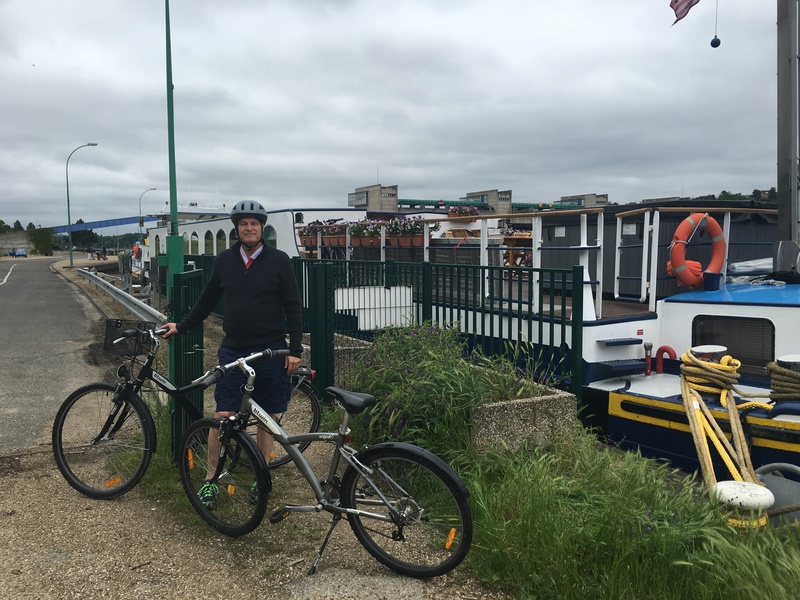 Bicycles and helmets on board provided a healthy way to explore the countryside, balancing the indulgences of the French cuisine. Many places along the canals and rivers still have remnants of tow paths, left from the days when mules pulled the barges through the canals. Today they make great walking and biking paths. 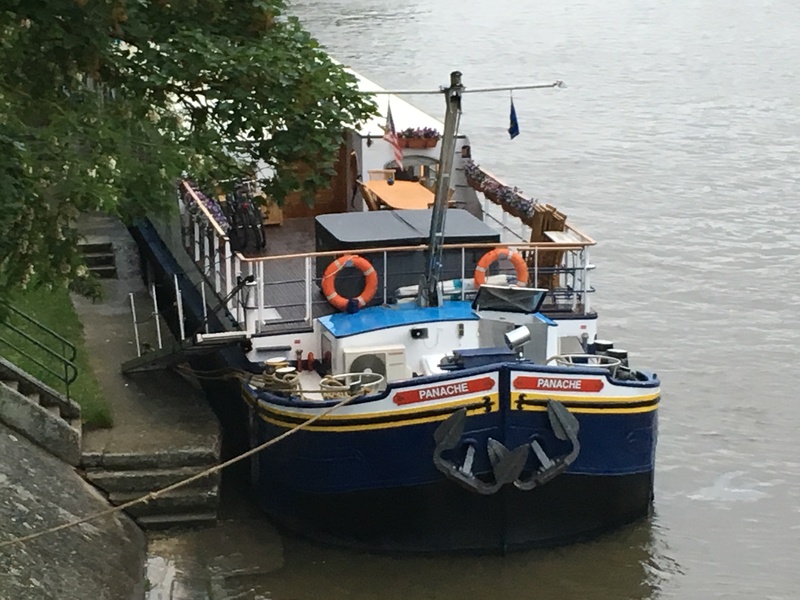 When the barge is docked, exploring the villages, or riding through the countryside felt like authentic living, something you don’t always experience when touring with a large group on a bus or giant cruise ship. 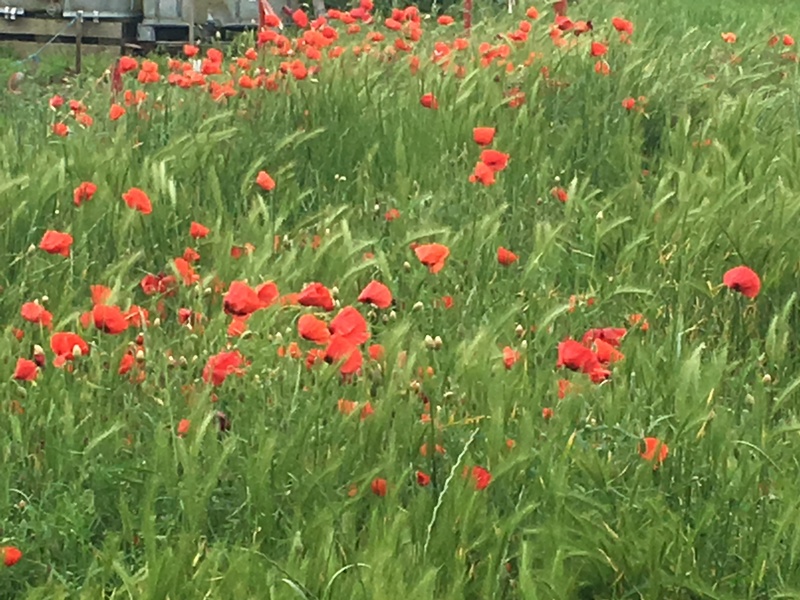 We slipped away one afternoon, just the two of us, to ride through miles of poppy fields. When we departed we let the crew know where we planned to go and what time to expect us back (a good safety practice). My husband and I recently discussed planning another European Waterways tour, and I asked what itinerary he would like to try. “Any of them,” he said, with fond memories of the gateaux our Panache chef Bryan made for him last year, and the fact that he didn’t have to wash dishes, his daily chore at home, for a week. The lesson here, don’t be too particular about what itinerary you choose. Because, really, there isn’t a bad choice. Like all great things in life that we think are a “once in a lifetime” opportunity, once you have a fabulous experience, you will find a way to do it again. 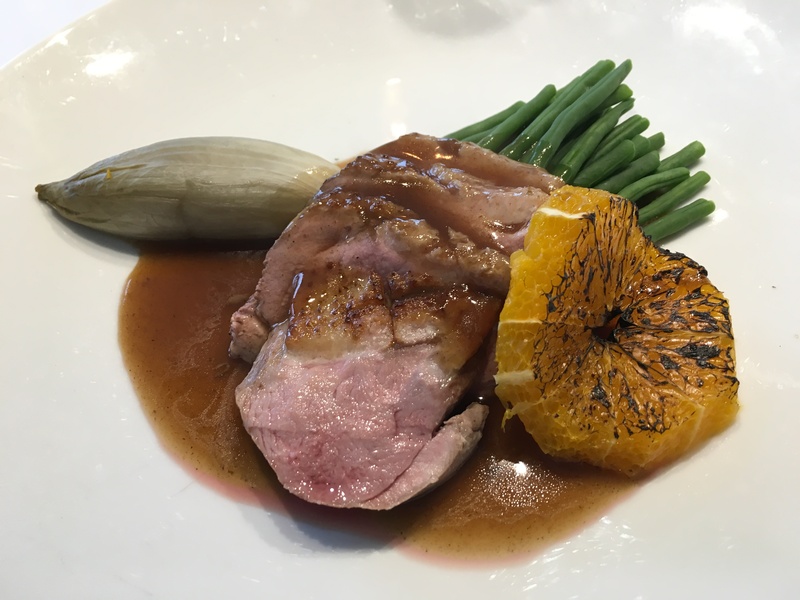 Make sure to check out our Avalon Waterways River Cruise Review if your looking for more European River cruise inspiration.